ISLAMABAD, April 3: The Patron-in-Chief of the Supreme Shia Ulema Board and chief of the Tehreek Nafaz Fiqh-e-Jafariya Agha Syed Hamid Ali Shah Moosavi has said that ugly and brutal Indian face has been unveiled on the world and the international world has started increasing pressure on India for solution of Kashmir issue. The purpose of Pulwama like conspiratorial objectives is to shift this pressure on Pakistan. Reports from organisations like the United Nations Human Rights Commission and the Amnesty International are negating the Indian claims of secularism while India has slapped in the face of human freedom and unveiled her so-called democracy by rejecting the reports of international organisations. India is taking steps on the pattern of Israel to turn the Muslim majority into minority in the Indian Occupied Kashmir, however, the Article 35A of the Constitution is a hurdle in Indian designs. The personality of Imam Musa Kazim (A.S.) is the beacon of light for freedom, independence and greatness. Imam Musa Kazim (A.S.) was the symbol of firmness and stability and had confronted with oppression, suppression and brutality and bore every atrocity but he could not be diverted to the righteous path through these tactics. He kissed Shahadat but did not compromise on oppression. The Mazar of Imam Musa Raza (A.S.) is the place of acceptance of Duas as his Marqad is designated at Babul Hawaij. The gathering of millions of people on the Youm-e-Shahdat of Imam Musa Kazim (A.S.) in Baghdad pronounces victory for the oppressed and defeat for the oppressors. These views were expressed by him while addressing the Majlis-e-Shahadat of Imam Musa Kazim (A.S) on the occasion of International Youm Babul Hawaij. Agha Moosavi said that Jammu & Kashmiri Citizenship Law passed in the Hari Singh era had been included in the Indian Constitution in the shape of Article 35A of the Section 370 was ratified in 1954 and the State Assembly had also approved it. He said India is trying to do away with this law by submitting applications in the Supreme Court. He said Jawahar Lal Nehru has promised in the United Nations and at different places of the country to carry out plebiscite in Kashmir but almost 75 years have passed by but India herself is a hurdle in the adoption of United Nations Resolutions and is putting forward self-created arguments to prove Kashmir as her ‘Atoot-Ang’ and is trying to defame Pakistan on international level for its support to Kashmir. The TNFJ chief said the Umavi government was spending its dying moments when the ninth precious pearl of Ismat and Taharat Imam Musa Kazim (A.S.) opened his eyes in the Khanwada-e-Imamat and Wilayat Imam Jafar-e-Sadiq (A.S.). His birth laced the world of knowledge and ma’arfat with ‘Basharat’ and enlightened the hearts of humanity with hope. He said the sayings of Imam Musa Kazim (A.S.) are the beacon of light for supporters of righteousness. He said that Imam Kazim (A.S.) has stated that accepting the favour (ehsaan) of someone is such a chain in the neck of human being the return of which is either favour (ehsaan) or to offer thanks to the favour-giver while Kuffara for working in the oppressive government is to do good for a brother in religion. He said that prisons of the rulers of his era could not shatter his spirits and he used to thank Allah for providing loneliness to perform worship instead of being disappointed on being gaoled in prison. He said Hazrat Imam Musa Kazim (A.S.) used to worship to the extent that watchmen posted at these prisons were got influenced. 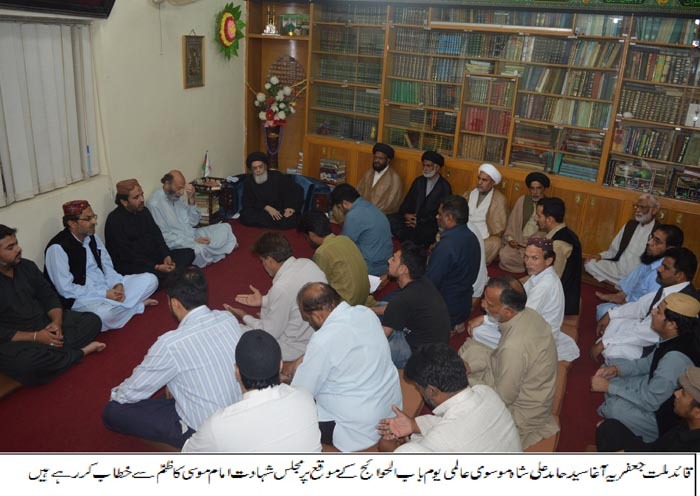 Meanwhile, according to information received at the headquarters of the Maktab-e-Tasheyyo, Majalis-e-Shahadat of Imam Musa Kazim (A.S.) were held and Taboot processions were taken out the world over and in all cities of the country. In the twin cities of Rawalpindi-Islamabad, Taboot Aseer-e-Baghdad was taken out from Markazi Imam Bargah Jamia Al-Murtaza G-9/4. The central procession was taken out under the auspices of Syed Qasim Ali Shah from the residence of Ghulam Haider Shah and terminated at Darbar Sakhi Shah Piyara. The central procession in Punjab was taken out from Rawal Cooker Sialkot under the auspices of TNFJ in which thousands of mourners participated. In Peshawar, central procession was taken out under the auspices of Kiyani brothers. Moreover Taboot processions were also taken out from all cities, towns and villages including Lahore, Karachi, Multan, Sukkur, Quetta, Haripur, Abbottabad, Hyderabad, and Kohat. The Farzandan-e-Tauheed participated in these processions and paid Pursa of Shahadat of Farzand-e-Rasool Imam Musa Kazim (A.S.) in Bargah-e-Risalat and Wilayat.